Teresa Julian (TeresaJ25, #1348) has received a certificate of achievement in Garden Gate for earning a Beginner Level Backyard Farmer Merit Badge! “I used to purchase farm fresh eggs from a woman around the corner. I had always wanted my own flock, but my husband was not convinced that our suburban neighborhood would welcome them. Finally, after much debate, hubby agreed! I ordered 5 chicks from mypetchicken.com and a few months later we welcomed our newest additions to our family! Buying organic feed is pricy, but at least I know that my chickens will be their healthiest… especially when they get to enjoy organic kitchen scraps too! It's turned out AWESOME! My fresh eggs don't even compare to my neighbor ... I think it has something to do with the super~freshness of nesting box straight to the pan! And by the way, not too long ago, I caught my wonderful husband taking pictures of the chickens! I guess they won him over! Teresa Julian (TeresaJ25, #1348) has received a certificate of achievement in Farm Kitchen for earning a Beginner Level Unprocessed Kitchen Merit Badge! “While trying to eat healthier, I have gotten rid of a lot of the processed junk food that my family would consume on a daily basis. I realized that I can't expect my family to go without "guilty pleasures" without some sort of revolt! So we decided to create our own, using organic ingredients. Cupcakes were the clear winner! We went to the store and first looked at a boxed cake mix. My kids got funny looks on their faces when they were trying to read the list of ingredients… we couldn't pronounce half of them and the other half didn't sound like things we wanted to put in our bodies! The recipe we used called for things like milk, butter, eggs, flour, salt, sugar, and baking powder. 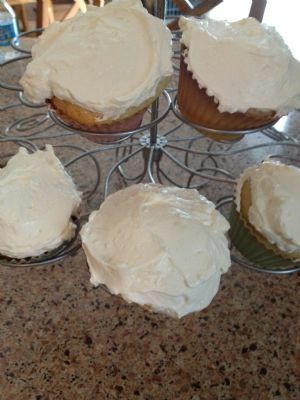 The icing only required butter, eggs and sugar. We found all these items organically. They are expensive, but worth it. Vicki Johnson (#5773) has received a certificate of achievement in Farm Kitchen for earning a Beginner Level ChillOver ComeOver Merit Badge! Vicki Johnson (#5773) has received a certificate of achievement in Farm Kitchen for earning a Beginner Level Get it Together Merit Badge! Vicki Johnson (#5773) has received a certificate of achievement in Farm Kitchen for earning an Intermediate Level Get it Together Merit Badge! Vicki Johnson (#5773) has received a certificate of achievement in Make it Easy for earning a Beginner Level Let's Get Physical Merit Badge! “I started going back to the gym 1/3/14. Teresa Julian (TeresaJ25, #1348) has received a certificate of achievement in Stitching & Crafting for earning an Intermediate Level Crochet Merit Badge! “I made a baby afghan for my Goddaughter and presented it to her mom at the baby shower. It was really challenging to make this blanket! I have a great group of crocheting friends and we would get together for lunch and crochet once a week. It helped having friends around when the pattern confused me! I couldn't front post or back post double crochet, but now its a snap! Mom and Baby Ella love it! Suzanne Holland (Suzanneh, #828) has received a certificate of achievement in Cleaning Up for earning an Intermediate Level Shopping Green Merit Badge! “I have been collecting and compiling recipes for quite awhile for different cleaning products to use through out our home. My husband brought home special spray bottles from the lab where he works for us to use. I love using essential oils (lavender and lemon are the ones I use most). It has been pretty easy to transition over to non-toxic cleaners because we were pretty close to having that already and my husband has been on board with the idea from the beginning. The laundry detergent I make is great....my daughters help me mix and cook it down( we use the liquid one). Suzanne Holland (Suzanneh, #828) has received a certificate of achievement in Cleaning Up for earning an Expert Level Shopping Green Merit Badge! “I don't have any farm girls near me so my daughters who are working on their young cultivator badges have been collecting and using shopping bags with me. This past Fall we designed and made bags to use in addition to the ones we already have. Suzanne Holland (Suzanneh, #828) has received a certificate of achievement in Cleaning Up for earning a Beginner Level Green Energy Merit Badge! “Well I almost feel like I got to cheat on this one. I live in St. Francisville , La and we have a nuclear plant .....my husband is a nuclear chemist at that plant so I got the inside tract. Entergy, where he works powers itself and then supplies a coal plant across the river who makes more . It also supplies Baton Rouge and surrounding area and sells it to Demco. Demco is the electric company we by our electricity from in St. Francisville after they buy it from Entergy. LA doesn't have hydro. Because of the land layout. Suzanne Holland (Suzanneh, #828) has received a certificate of achievement in Cleaning Up for earning an Intermediate Level Green Energy Merit Badge! “When we moved into our new house we started keeping track of our expenses. First of all we had moved far out from town so we wanted to track what we were spending on fuel and how much running back and forth we were doing. Secondly, we had taken special efforts to install energy saving windows and doors. We sealed extra before putting insulation and sheet rock up. We live in the South so summers are brutal. Our natural gas bill (heater, water heaters, gas cook top). Goes down. Electric goes up during school months my running is high because I have four kids. They do ride the bus, but, sports, after school events, Dr. Appt. etc. We installed energy saving items throughout the house. Suzanne Holland (Suzanneh, #828) has received a certificate of achievement in Cleaning Up for earning a Beginner Level Recycling Merit Badge! “I live in a small town, so there is NO curb side re cycling. There is how ever a very nice recycling center in town for drop off. You sort before you drop and the big bends are there to put thing in. My girls and I have bags set aside in my pantry for sorting. We collect and when the bags are full we run them into town. Suzanne Holland (Suzanneh, #828) has received a certificate of achievement in Cleaning Up for earning an Intermediate Level Recycling Merit Badge! “Well this is a continuation of the first step. My girls and I have been recycling for almost two years. We have become very good at sorting through what goes where. Suzanne Holland (Suzanneh, #828) has received a certificate of achievement in Cleaning Up for earning an Expert Level Recycling Merit Badge! “Almost two years of recycling under mine and my girls belts. It becomes second nature after awhile. We have a neighbor that we trade seeds with. She is only here part time. We share from our garden and dehydrate herbs together. We told her where the recycling center was in town so she could recycle while she was in town. Suzanne Holland (Suzanneh, #828) has received a certificate of achievement in Cleaning Up for earning a Beginner Level Home Insulation Merit Badge! “Well, new house, so information is easy to locate since I was the one organizing all the sub-contractors. One of the first things my husband did was go back a seal every single joint and seam before the insulation and Sheetrock went in. He checked with a light at night to make sure he had a good seal. He did the same around the windows and door. My husband does do routine checks and caulks as needed. Suzanne Holland (Suzanneh, #828) has received a certificate of achievement in Cleaning Up for earning an Intermediate Level Home Insulation Merit Badge! “I help my husband keep a look out for drafts and things that need caulking. Suzanne Holland (Suzanneh, #828) has received a certificate of achievement in Cleaning Up for earning an Expert Level Home Insulation Merit Badge! “After going through two winters in our home, we have watched the blow in insulation settle like it always does. We have decided to blow in another layer to give a higher r value. It helped a great deal in our last house because of the sweltering hot summers. Suzanne Holland (Suzanneh, #828) has received a certificate of achievement in Each Other for earning an Expert Level Entrepreneurial Spirit Merit Badge! “I started my business after I finished my apprenticeship over 25 years ago. I built my clientele slowly through word of mouth and reputation. Before I knew it I had clients from Hawaii to Germany from Texas to New York. 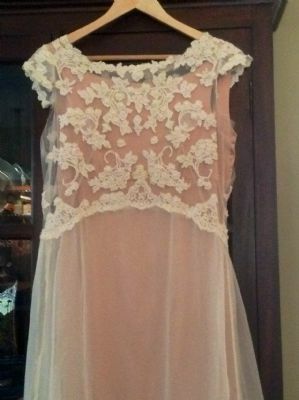 I enjoyed designing and making wedding dresses and formals for over 20 years. Suzanne Holland (Suzanneh, #828) has received a certificate of achievement in Stitching & Crafting for earning a Beginner Level Sew Wonderful Merit Badge! “I already have tons of sewing equipment and all the things needed. It comes with my job. But my girls are just learning how to sew ... and my boys too, so this past summer the girls and made up kits for them to use when they sew. 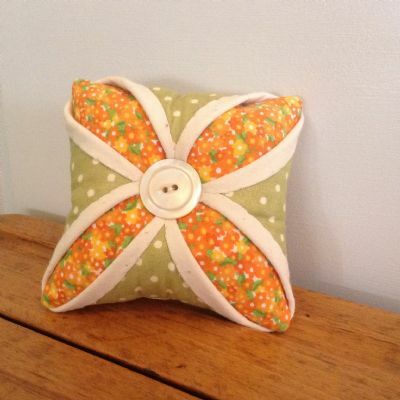 Alice takes hers with her when she goes to 4-h sewing. Suzanne Holland (Suzanneh, #828) has received a certificate of achievement in Stitching & Crafting for earning an Intermediate Level Sew Wonderful Merit Badge! “I started having to learn how to tie a knot with one hand (3 fingers) and then went straight into learning all those seams by hand to perfection before going on to the machine version. Suzanne Holland (Suzanneh, #828) has received a certificate of achievement in Make it Easy for earning a Beginner Level Carp-hen-try Merit Badge! “Ok my husband and I just finished building our third house together (and we are still married -- I should get a badge for that). This is our final home and we did pretty much all the work ourselves. We have it down to a science now. He does the big manly stuff and I do all the tile work, staining and waxing of floors, fine detail painting, and we tackle the electrical installs together. Suzanne Holland (Suzanneh, #828) has received a certificate of achievement in Make it Easy for earning an Intermediate Level Carp-hen-try Merit Badge! 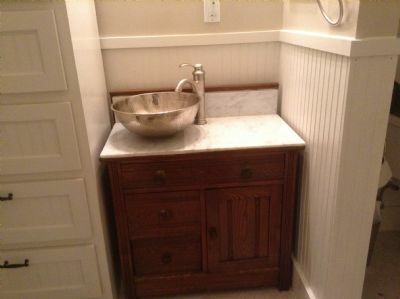 “I bought an antique piece for my boys bathroom to be used as the sink. I sealed it with water. But that didn't stop my boys from messing it up. So I went and purchased Carrara Marble tiles from a place in New Orleans. I took out the vessel sink and cleaned up the wood. Then I used my tile cutter to make the necessary cuts. Rebecca Riccio (ladybek9756, #4932) has received a certificate of achievement in Cleaning Up for earning a Beginner Level Shopping Green Merit Badge! “I already had 3 bags that I had purchased over this last year. 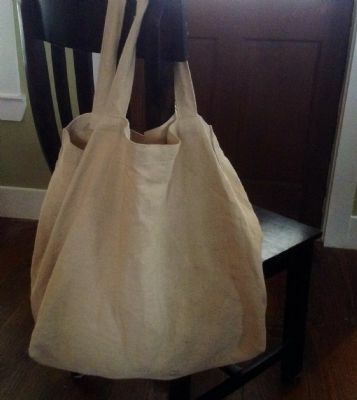 I received a bag from a friend for my craft projects that was perfect for shopping those perishable items like eggs or bread. I purchased fabric for the over 3 I have now. I have been using them for the last 2 1/2 months and find they are better since I can have more control over how my items are packed. Love not having to store plastic bags any longer. Rebecca Riccio (ladybek9756, #4932) has received a certificate of achievement in Each Other for earning a Beginner Level Languages/Culture Merit Badge! “Since I had to take a foreign language for my BA degree, I chose French. I learned this last year how to count to 100, and the grammar parts of the language. I can speak a little after just one year. Rebecca Riccio (ladybek9756, #4932) has received a certificate of achievement in Farm Kitchen for earning a Beginner Level Get it Together Merit Badge! “I had a cabinet that was over flowing with plastic containers and lids everywhere. I went through and matched everything up and gave my husband the remaining containers for him to use in his garage. Then I went through the rest of my cabinets and got rid of all the mis-match items I had and the extra dish sets that I don't use anymore. I gave them away to Goodwill. Now I have more space in my cupboards to add those items I am missing.